That time of year has come again, back to school and all the shopping it requires. The kids need school supplies, backpacks, lunch boxes, and new clothes. Does this strike fear in your heart? 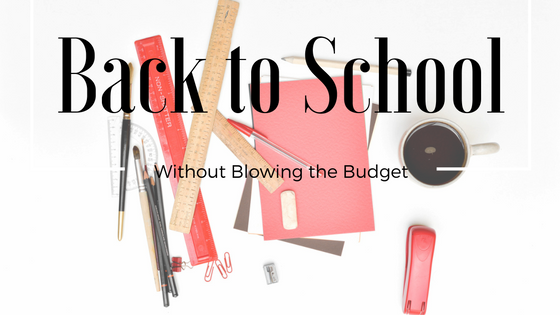 No worries, we have some tried and true tips to get back to school shopping done without blowing your budget. Do they have anything they can still use? This is your chance to go through their current clothes and supplies to see what is still usable. Have them try on all their clothes to see what still fits and is in good shape. Sort into three piles, keep, toss, and donate/sell. If you have more than one child, decide if any of the clothes can be passed to a sibling, this is a good way to save on basics. Make a list of what you are keeping and a list of what you will need to buy. A good guideline for girls is 2 pairs of jeans, a pair of khakis, a few each of shirts, polos, and tees. Add a light jacket or sweater and a dress or skirt to complete a basic wardrobe. For a boy, 3 pairs of jeans, 2 pairs of shorts, 5 short sleeve shirts like polos and tees, a few long sleeve shirts and a hoodie or other lightweight jacket should be enough. And if you live in a climate that requires cold-weather gear, make sure to figure that into your needs as well. Next, pull out the backpacks and see if they are still in good shape. Make sure to check that all the zippers work, the straps are in good shape and the pockets don’t have holes in them. If the size is still right and it is in good shape, you will be set at least for the beginning of the year. This is probably the most important step! You will need to decide how much you can afford to spend on clothing and supplies, and whether to use cash or put some things on credit cards. To figure out how much to spend, start by reviewing purchases from last year and figure a slight increase for inflation. Kids grow pretty fast, so you might want to allot some money for about halfway through the school year to replace some things and to supplement with new clothes. I remember being excited when I got something new later in the year and it was something nobody else had yet. As your kids get older, you can involve them in the budget, let them know you have a certain amount to spend and it can be divided up into two trips or a monthly clothing allowance. There are lots of ways to get extra savings on back to school shopping, for instance, many states offer a tax-free weekend to help with costs. Here is a website that keeps track of dates by state and explains items eligible for the Sales-Tax Break. If standing in long lines to save a few dollars doesn’t appeal to you, keep in mind that the tax break applies to online purchases during the same time frame. Other ways you can get extra savings are with coupons, watching sales, checking at used clothing stores, or using an online shopping portal. Ebates and Giving Assistant will give you cash back for shopping online, and in person at some retailers. You can find great deals at retailers like Wal-Mart, Target, Old Navy and K-Mart for clothing basics as well as school supplies. Office supply stores like Staples and Office Max usually have the school supply lists for local schools in-store to make it easier to get everything. School supplies like pens, pencils, crayons, paper, printer ink and notebooks are a great value at warehouse stores like Sam’s Club and Costco. Since they don’t have an expiration date, if you have room to store some extras, you can reduce the chance of last minute trips out to replace items. Back to school is only stressful if you let it be, so stay calm and take your time to get the best bang for your hard-earned money. Here at BillCutterz, we understand how important it is to maximize your savings, so hopefully some of these tips will make a difference for you. We enjoy saving money here at BillCutterz, if you have any other ideas or questions feel free to share in the comments below. Don’t forget to visit our other blogs for upcoming holidays and tips on how to save money!